What if your first kiss was held suspended in time, bestowed as all in the room succumb to the power of magic? There’s no doubt Erin Morgenstern has created magic. In her debut novel, two opponents fight in a lifelong battle of skill versus skill in a mysterious challenge that threatens to rip the world apart. Well, some of it anyway. The black and white tents of Les Cirques des Rêves appear without warning, suddenly occupying space that was empty the day before. Drawn by its mystery, townspeople enter and are enthralled by nights filled with mystery and feats of extraordinary talent. But who is behind it all? Bound as children to a contest they do not understand, raised without love by men they barely know, Celia and Marco are rivals in an arena that defies convention. It is a dreamland, one that speaks to the hearts, souls and imaginations of not only the audience, but the creators of each exhibit. Dazzling and intricate, the circus is a living thing, and perhaps Morgenstern’s most brilliant invention. Every decadent page speaks of love, betrayal, hope, mystery and magic. It’s a love story, but it’s so much more. As pawns trapped in a cruel wager between two powerful, magical and proud men, Celia and Marco must not only discover the nature of the challenge, but how to play and ultimately win. Each tent is not only a display of immense talent, but a secret token of affection to one another. Poetry runs down the trunk of a tree, an ice forest grows and blooms and a reflecting pool transcends grief and loss. I was drawn in by the early buzz, but skeptical of the label “Harry Potter for adults.” I take issue with this. It is a desperate plug for publishers and entertainment houses in a post-Harry Potter and Twilight world to gain what they love most: money. First of all, Harry Potter is just as much for adults as it is for kids and teens. It’s just that good. Tread carefully when invoking Harry’s name, people! Anyway, I received my copy, and from the very first line, I was entranced. The hook is fantastic. It’s a confident work, and I will smile whenever I see splashes of red alongside black & white. I’m certain it will be a trend, with the book generating its own rêveurs. The book is not for the impatient: though the chapters are brief, each slice of the circus is delivered leisurely. Glimpses are provided through different characters, descriptions of challenges created and answered and through the players themselves. It’s slow, but maddening only because the desire to know more about the circus is so strong. I want to say more, but some tents are left better explored at one’s own pace. Enjoy. 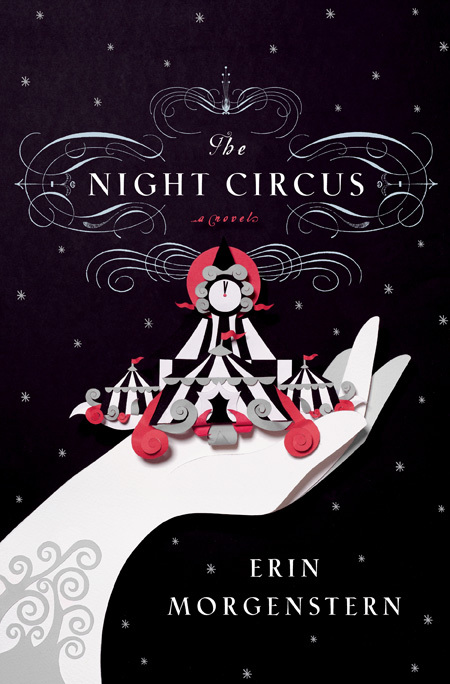 This entry was posted in Books and tagged circus, Erin Morgenstern, fiction, illusion, magic, reveurs, romance by S.D. McPhail. Bookmark the permalink.